It is a pleasure to see that SCIA’s customers in the Netherlands are also successful with their projects in other competitions besides the SCIA User Contest 2015 – “The Art of Structural Design”. Quite a few projects have been awarded or nominated in the celebrated Beton Prijs 2015. Our congratulation go to the winner of the Beton Prijs 2015 in the category Bridges. This project was also nominated in our User Contest in the category bridges. This bridge is an in-situ post-tensioned concrete bridge with a total length of 275 m. With its spectacular double curved lower shell and hybrid foundation, several challenging problems had to be solved. We are proud that some of these challenging problems have been solved using our software SCIA Engineer. Secondly, our congratulation also goes to the nominee in the category Non-Residential Buildings (Utiliteitsbouw). “De Rotterdam” also participated in our User Contest in the category Buildings. This structure is a high rise building described as a vertical city. 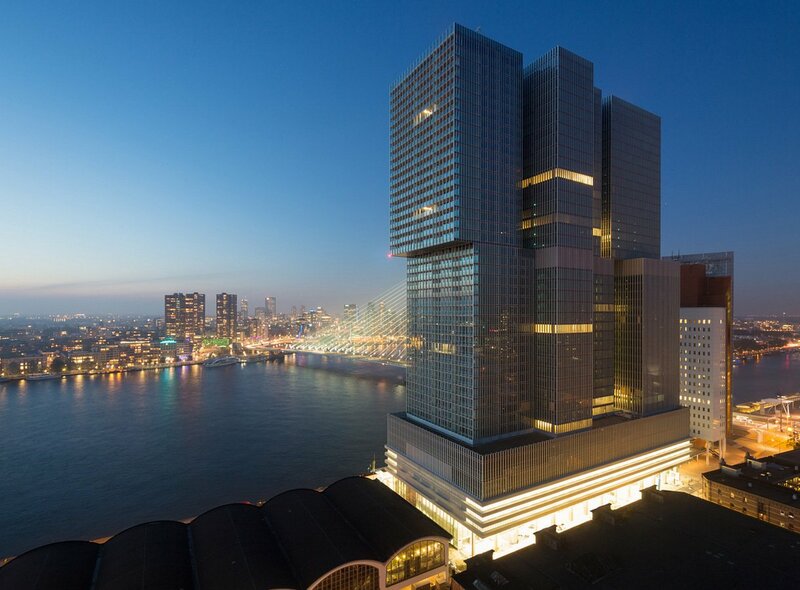 With three 150 m high towers including residential, commercial, hotel and parking facilities, the building is a giant that has no equal in the Netherlands. SCIA Engineer was used to investigate the soil-structure interaction and analyse the deformation of soil and structure from the earlier stages of construction until 30 years after the completion. Finally we would like to congratulate the nominee in the category Execution (Uitvoering). This project was the winner in the category “Special projects” in the latest SCIA User Contest. Markthal in the centre of Rotterdam is a unique project in many ways. It is the first covered market hall in the Netherlands, enveloped in apartments and enclosed by cable net facades at the front and back.